Why is AΣA Right for Your Daughter? » Why is AΣA Right for Your Daughter? Becoming a member of Alpha Sigma Alpha is a decision that will impact a woman’s life forever. 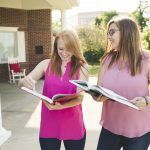 There are many ways Alpha Sigma Alpha can enhance the collegiate and alumnae experience for women. The relationships your daughter will make within Alpha Sigma Alpha will give her a home away from home. Her sisters will be her support system, her study buddies on Sunday nights and her rides to and from class. Within Alpha Sigma Alpha and her Panhellenic community, your daughter will have many opportunities for leadership. She can get involved in planning community service activities, campus fundraising events, managing the public relations for the chapter or serve in another officer position. Members of Alpha Sigma Alpha all across the nation are the leaders on campus as well. From residence life to student government to captain of the women’s soccer team, members take the leadership development they receive through AΣA and apply it to all aspects of their life. Members are required to participate in at least 25 hours of community service every year through participation in national or local philanthropy events. Undergraduate members of Alpha Sigma Alpha are students, and their commitment to their degree is a priority. Alpha Sigma Alpha offers academic support to our members through scholarship programs, study hours and mentor programs. AΣA members on average have a collegiate GPA which ranks higher than the all-undergraduate, all-women’s and all-Panhellenic GPA.